San Antonio Spurs 15-time All Star Tim Duncan lost more than $20 million to bad investments at the center of a lawsuit filed Friday against his ex-financial adviser, a person familiar with the matter said. 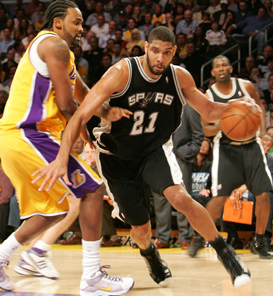 Duncan, 38, said he met Banks during his rookie year in 1998. At Banks’s urging, the athlete invested several million dollars in hotels, beauty products, sports merchandising and wineries that the adviser owned or in which he had financial stakes, according to the filing. On the morning of Oct. 7, two days before the Blue Jackets opened the 2014-15 season, Jack Johnson left his Ferrari parked in the garage of his Dublin apartment and drove his BMW to a federal courthouse Downtown to file for bankruptcy. Johnson has earned more than $18 million during his nine-year NHL career, not including the $5 million he will be paid this season by the Blue Jackets. Almost all of the money is gone, and some of his future earnings have already been promised — which is why Johnson, surrounded by a new team of financial advisers and an attorney, signed his financial surrender. The scene was nearly four years in the making, after a string of risky loans at high interest rates; defaults on those loans, resulting in huge fees and even higher interest rates; and three lawsuits against Johnson, two of which have been settled and one that’s pending. Why does this happen, not only to professional athletes but to many wealthy investors? Rich people are more at risk for fraud and deceit than anyone. The vultures are constantly circling to cash in. Unfortunately, a talented sales staff will nearly always trump a talented investor when motivating people to hand over their money. Hucksters are usually very good marketers, meaning they know which buttons to push to sell their services and which narratives to hit to sell a compelling “investment” idea. The ultra-rich have a much different risk profile than everyone else. They’ve already won the game. Even if they have an appetite for risk, they probably don’t need to invest in risky ventures to try and grow their capital. But because they’re so rich it actually makes it easier for them to take a few fliers in hopes of hitting a home run because they think they don’t have to worry about money. This strategy comes unraveled when leverage is involved with too many poor choices. There’s a very big difference between trying to get rich and trying to stay rich. It can be difficult for people to understand the difference between capital accumulation and capital preservation. It’s a completely different mindset. The peer pressure to invest in deals, restaurants, a friend’s business ideas, etc. grows exponentially when everyone around you sees the dollar signs. Everyone wants a piece of the action. Many rich people equate their wealth with briliance. People think the bigger their bank account gets the more intelligent they are in business. Arrogance has lost more money for people than poor investment ideas. Even the wealthy have to live within their means (as Larry Ellison learned from his financial advisor). Owning assets doesn’t make you wealthy. It’s your net worth, meaning assets minus liabilities ,that matter. Buying a bunch of stuff doesn’t mean you’re rich. It means you’re good at spending money. Consumption does not constitute saving. It’s difficult to find legitimate sources of financial advice that have your interests in mind, especially when you have a large bank account. There are even more opportunities for mis-steps when you make millions of dollars because everyone thinks they have the perfect investment idea for you. Instead of hearing sound financial advice, the wealthy often have to deal with people trying to impress them to get between them and their money. The biggest lesson here is that becoming wealthy doesn’t excuse you from paying attention to your finances. How does this happen time and time again? And to a guy like Tim Duncan…did not see that coming. Here’s a question…what would be your suggested process for professional athletes to select a financial advisor or fiduciary? What advice would you give to a 21 year old kid coming out of college and just signed a 4 year deal for $35MM in guaranteed money? We don’t hear that side of the discussion nearly enough. Just the burns and the “bad advice”. I finally got around to watching “Broke” on Netflix, part of the 30 for 30 series. It does a wonderful job trying to answer a lot of the same questions you presented here, regarding athletes specifically as it is an ESPN production. I think you would like it and highly recommend it. I liked that one. It’s insane how similar most of the stories are from those athletes.